It would seem that the proxy war that Washington has been waging on Syria has been nothing but a terrible, humiliating mess, but instead of calling it quits the White House is busy shifting gears again. While demonstrating its intention to strengthen its military presence in Syria, while still providing assistance to the Kurdistan Workers’ Party or PKK that is outlawed in Turkey, the US is now embarking on the mission of creating no-fly zones, the goal it has been after all along. To achieve this goal, the Pentagon has deployed its radar systems in a number of cities in northern Syria, that are supposedly going to be used to monitor the operations carried out by the Turkish military. It seems that the relations between Ankara and Washington has hit an all time low if it comes down to the latter keeping a watchful eye of the former. It’s obviously not a coincidence that the safety umbrella that US policymakers are trying to pop open over the northern Syria is going to cover massive detachments of radical militants that have been rallying in Idlib from all parts of Syria, and now we see the reasoning behind this trend. It’s clear that Washington didn’t want to waste those valuable psychopaths that received an extensive amount of military training, since it hasn’t lost hope that it could still take down Damascus if the no-fly zones plan comes into fruition. There has already been three full radars installations deployed in the areas of Kobani and Sarrin in the north of the Aleppo Governorate along with a total of 13 mobile radar systems that are going to be used for the monitoring of the Syrian sky. The rapid creation of no-fly zones in Syria has marked a new phase of Western military aggression against the Syrian Arab Republic. This scenario has already been tested by Washington in Iraq and Libya, that is why American think tanks have been pushing for this option in Syria for almost a decade now. Once a no-fly zone in Syria is declared, this step can followed by high precision weapons being used by the US-led coalition to destroy Syrian airfields, leaving Syrian armed forces without close air support. Should this plan come to fruition, any plane entering the no-fly zone will be detected and destroyed. Back in 2011, Washington was following the same exact path in Libya, first rendering Libyan airfield useless, before destroying radar installations and launch pads that could still prevent strikes on Libyan military facilities. However, one must not forget that, according to the UN Charter, the authority to maintain international peace and security rests upon the shoulders of the UN Security Council. Both Washington, and its obedient vassals like the Great Britain have no privilege to do whatever they want if the rights of yet another international player is violated by their actions. It is the Security Council that determines the course of action whenever any threat to the international peace and security surfaces on the horizon. In a desperate attempt to force the UN Security Council into introducing a no-fly zone over northern Syria, the United States and its allies have been staging a new chemical provocation, for this time in Idlib, in a desperate attempt to push the blame on Damascus yet again. According to the opinion voiced by a prominent Lebanese analyst, Nidal Sabi the threats that the US, France and Great Britain are voicing against Syria can result in an armed intervention against it, should there be a pretext in the form of chemical attack in Idlib presented as a justification. 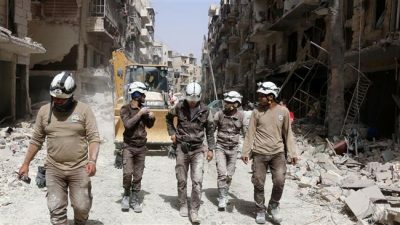 According to this expert, this provocation is being staged now by the accomplices of various terrorists groups that are known to the world as the White Helmets. This false-flag attack is going to mark the start of an all-out assault against Syrian people that is going to be mounted by the US-led coalition. According to the MSN, American warships are preparing to launch a total of 56 cruise missiles against various targets across Syria. Further still, this salvo is going to be supported by B-1 Lancers that carrying JASSM missiles from the US Air Force Al Udeid base in Qatar. This nothing new in this flawed circuit of the American foreign policy that goes from the provocation, to hysteria, to retaliation and the regime change. But its use in Syria will effectively mark the end of international law and global security. Washington is behind itself with its attempts to de-legitimize its enemy, that is why it feels bold enough to tread the limits of international law. And it is quite remarkable that without any sort of permission granted by Damascus, Washington has not just been illegally occupying a strip of the Syrian territory, it’s going to use this fact to stage yet another act of aggression against Syria, while being unable to hide its disgusting habits. However, nobody is willing to discuss that with the destruction of the Syrian air force, pro-Damascus forces will lose the last advantage they have had over the forces of international terrorism. Moreover, Russia has been pretty active in conducting air strikes again radical militants too. The unilateral declaration to establish a no-fly zone, and Washington will never obtain the approval from the UN Security Council to create one, will effectively mean the declaration of war against Syria, Russia, Turkey and Iran. The implications are obvious. Russia’s air forces will not flee, nor will abandon the bombing campaign, that has been of great assistance to Assad’s offensive. For their part, Syrian jihadists will only rejoice if the “two Shaytans” will try to consume each other with infernal fires. But for the United States and Britain, such a prospect can also lead to serious consequences. In the US there’s an ever increasing number of people wonder what is the reasoning behind Washington’s obsession with regime change in Syria and is it really worth all the risks that that the Trump administration is so willing to ignore that it gets disturbing. American instructors that keep training all sorts of radical militants all across the Middle East are joking they are breeding the “next generation of al-Nusra,” but will they be just as cynical if they learn that these skills are going to be put to the test both in the EU and in the US itself.